Focus on about a 1-inch section of hair at a time. You may increase or decrease this amount based on the texture of the person's hair. Comb the section from the root to the tip to smoothen and straighten it out. Hold the section of hair in between your pointer and index finger so that about 2 inches of hair come between your fingers and the tips of the section of hair. Point the shears into the 2 inches of hair. You may choose to cut straight into the section or to go slightly on an angle. If you choose to thin the hair on an angle, you will remove more hair at one time. 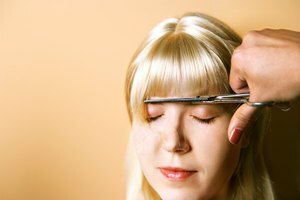 Continue to cut into the section until you have removed the amount of hair necessary for the desired hair style. Use this technique in all areas of the hair that you would like to reduce weight and thin. 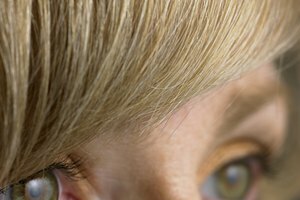 Comb your fingers throughout the person's hair to determine if you need to go over a section of hair again. This technique works for both wet and dry cutting. However, it is harder to gauge the amount of hair that you are removing when the person's hair is wet. 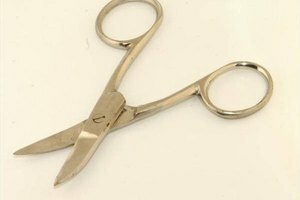 To thin the hair more, you may choose to point the shears into the middle of the strands in one section of hair and work the shears down the section, opening and closing slightly and frequently. Doing this will remove more hair from each section.